The Driving Experience Switch can be used to adjust the driving dynamics of the vehicle. For this purpose various programs are available for selection that are activated via the two buttons of the Driving Experience Switch and the DSC OFF-button. 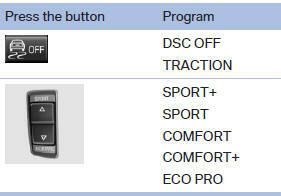 For Dynamic Damper Control, the lower button is labeled with COMFORT. ▷ Failure of Integral Active Steering. ▷ Failure of Dynamic Damping Control. ▷ The vehicle has a flat tire.